So the other day I bought a mascara. Not really that much of a big deal. I guess you could say it looks like a lot of other mascaras out on the high street at the moment. The difference? This mascara is part of a relaunched Chit Chat makeup range I spotted in Poundland. While you're probably thinking I only ever buy makeup in pound shops, I'll be deflecting your attention to the brush. The reason I picked this up was that I strongly suspected a mahoosive mascara wand... and I was right. While the formula itself is really wet, the large brush is what made me try this product. I'm not normally one for brushes as big as this but at the moment my current daily mascara is giving up the ghost and I'm all for experiments. For £1, I could definitely justify trying this out. 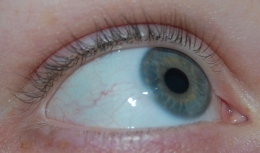 Now here is the obligatory creepy 'before' photo of my eye with no makeup on to show my natural lashes. What you can see below is the after. 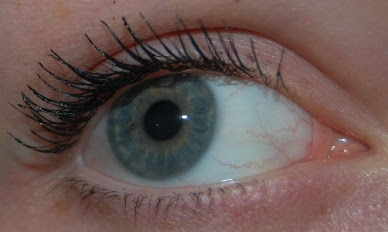 The plus points of this mascara are the price, pigmentation and lengthening properties. With one tiny dab of the wand, my lashes were instantly black. Applying this in gradual thin coats seems to be the way forward (which as you might be able to see from my sloppy application, I didn't quite manage) and so it definitely does do what it says on the tin. The wand reached the base to the tip of my lashes fine, however I did really have trouble with the wetness of the formula. Once it was on, it seemed to get everywhere. I also had an issue with getting mascara on my eyelids, which is a pet hate of mine. Finally when I was taking this off earlier, I got major panda eyes thanks to the uber pigmentation. Perhaps it might not be so great if it rains? If you compare this to my previous review and photos of the Maybelline New York One by One mascara the photos don't actually differ too much. I'd say that the One by One covers my lashes individually and adds more volume. It also adds a lot more control. But if you can be more careful with your application than I was I'm sure the results would be pretty close. I'll definitely keep playing with this mascara because despite its flaws I have yet to try a better mascara for as many pennies. I almost feel I'll regret saying that when it comes into contact with the air a little bit, it'll probably be better, because I don't want this to die off too soon! 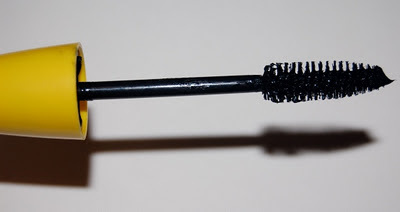 Personally I like a little bit more control and volume in a mascara but when I applied this over a base it really gave a lot more impact to the look. Either way I can still see myself reaching for this quite a bit. For £1, I can't really argue with that. Will any of you be checking out the revamped Chit Chat range? The mascara caught my eye as it is obviously modeled on Maybelline's Cat Eyes mascara. I'm not hugely 'into' makeup but I like to have dramatic eye makeup everyday and minimal everything else. So a wide strong eyeshadow colors, liner and mascara are an absolute must. But on my student budget, I can't be paying full whack for 5 colors on the go at once. I thought this ChitChat thing was a one-off, not a range, so I grabbed the lash building mascara while I could. After nabbing secondhand MaxFactor from family, I have a vague experience of how higher-end makeup is supposed to perform. Before rushing out of the door I thought 'what the hell' and gave the £1 mascara a try. One quick brush through and I thought 'Oh, s***, I wasn't expecting that' I could feel the brush making use of itself and my lashes instantly looked volumized without being too clumpy. This stuff is pretty good, the only drawback being if some of it dries too close to the corner of your eye it might sting an bit if they water and it 'spills in', but if you don't overdo it in the first place, it's not an issue. I'm the same... Not hugely into makeup, love dramatic eyes and minimal everything else on a student budget. The formula is indeed a bit wet, but after keeping this mascara for 2 years I decided to use the same wand with a genuine maybelline mascara (it actually screwed in perfectly to the real mascara) Match made in heaven. The results are BETTER than with the genuine wand.